Archival research has revealed that the wardrobe discovered near Texel belonged to the royal court of the English queen Henrietta Maria. In March 1642 the queen was travelling to the Netherlands on a secret mission when one of her baggage ships sunk in the Wadden Sea. This discovery was made by cultural historians Helmer Helmers from the University of Amsterdam (UvA) and Nadine Akkerman from Leiden University (currently at NIAS). 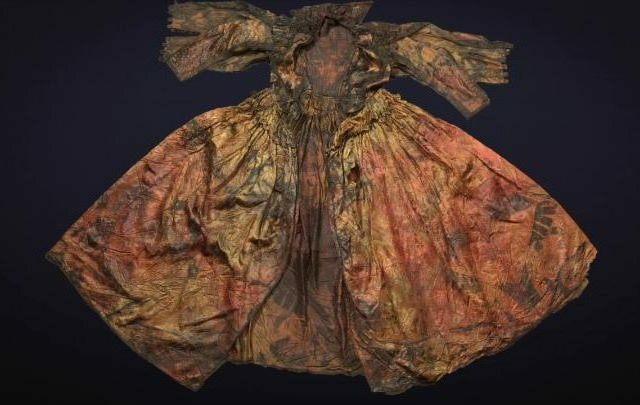 The now famous silk gown is still remarkably well preserved and is the showpiece of a larger archaeological find near Texel. It probably belonged to Jean Kerr, Countess of Roxburghe (c. 1585-1643), lady-in-waiting and confidante to Queen Henrietta Maria (1609-1669). Jean was one of two ladies-in-waiting whose clothes went down with the ship, but the style and size of the gown indicates strongly that it belonged to Kerr, the elder of the two. Cultural historians Nadine Akkerman and Helmer Helmers are experts on the British Royal House of Stuart. Their findings are based on a letter written by Elizabeth Stuart (1596-1662), the Stuart princess who found refuge in The Hague after being exiled from the Kingdom of Bohemia. In a letter to the English diplomat Sir Thomas Roe, dated 17 March 1642, Elizabeth describes how her sister-in-law lost a baggage ship during the crossing. In addition to the clothing of two ladies-in-waiting and their maids, the queen herself lost the ‘vessels’ from her private chapel in the shipwreck. The official story behind Henrietta Maria’s trip to the Dutch Republic was one of royal connections: she was delivering her 11-year old daughter Mary to the court of William II, Prince of Orange and future stadtholder, whom the girl had married the previous year. This was only a ruse, however: her real mission was to sell the crown jewels and use the proceeds to buy weapons. These were essential for King Charles I to take on Parliament in the English Civil War. According to Akkerman and Helmers, the find at Texel represents a tangible reminder of the strong Dutch involvement in this conflict. Akkerman is the editor of the Correspondence of Elizabeth Stuart, Queen of Bohemia, while Helmers is the author of The Royalist Republic, on Anglo-Dutch relations in this period.